Of course by now you've heard. ESPN's College Gameday "is comin' to our citaaaay". Truth be told, I can't stand that song but I do embrace what it represents. Its the price you pay for getting to enjoy college football's most lucrative and obnoxious hype machine during your Saturday morning coffee. This Saturday will mark the 29th time Michigan has been a featured school, either home or away, on the premier CFB preview show. I thought this would be as good a time as any to dive into some of the numbers and break down how Michigan has fared over the years. After all, Michigan was on the second ever "on-location" broadcast way back in 1994 at Notre Dame. As you can clearly see, Michigan has struggled as a featured school on the show in recent years, dropping 10 of their last 13, the last win coming in 2013 when Notre Dame came to town. Overall, Michigan's 29 appearances ranks 6th all time behind Alabama (42), Ohio State (42), Florida (37), Oklahoma (35) and Florida State (34). Michigan has a .500 record, going an even 14-14. 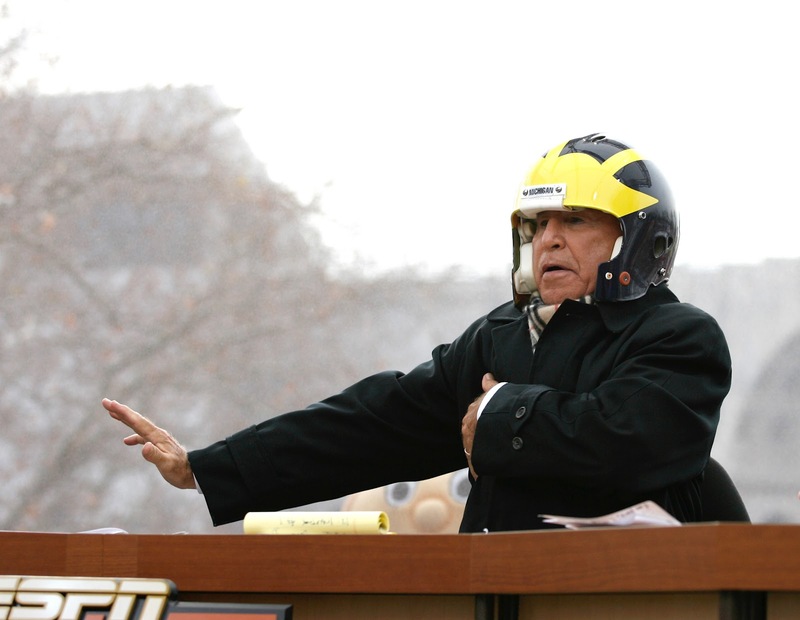 Lee Corso has donned the non-existent Michigan headgear 13 times and he's been correct 9 of those times. I don't think began the tradition of the headgear until 1996, but he did make picks prior to that. Michigan has been the host school 12 times (not including this weekend) and sports a 9-3 record, while going 3-6 on in true road games and 2-3 at neutral sites. In rivalry games, Michigan is 5-2 vs Notre Dame, 1-4 vs Ohio State and 1-2 vs Michigan State. Versus this week's opponent, Wisconsin, Michigan posts a 2-1 record. ...and Jim Harbaugh is 0-5. And that right there is really the crux with both Michigan fans' beef with College Gameday showing up and the national media/fans' beef with Michigan under Jim Harbaugh. There's no doubt that when Gameday comes to town, it's a huge spotlight shone on your schools program and the matchup later that day. And when the national attention gets directed at the Michigan program, the Wolverines largely struggle to deliver on all of the hype. Wins have eluded Michigan in big games under Jim Harbaugh. Fair or not, it's simply just the reality. I have no idea what to expect this Saturday night at the Big House. With Gameday in town, a primetime game on ABC with Fowler and Herbstreit, a very good ranked opponent used to playing in and winning big games, and of course Michigan's checkered history in such games against such opponents...the only thing I think you can really expect...is to be surprised.